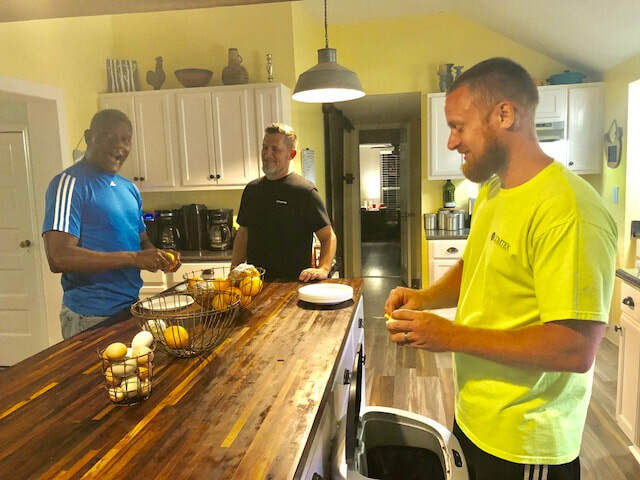 Fishers Farm is a residential discipleship center that serves men who are struggling with homelessness and various addictions including drugs and alcohol. We believe that substance abuse and addictions are due to an incorrect relationship with Jesus Christ. Our mission team lives in the house with the residents to form a sense of support and community. For the purposes of learning responsibility and receiving discipleship training, we offer a tailored program that will establish a foundation in biblical thinking which transforms every aspect of a life destroyed by addiction. Fishers Farm charges a one time enrollment fee of 700.00. This fee covers materials and other essentials for the resident as long as they are at Fishers Farm. There is a minimum 9 month commitment needed for anyone coming to live at Fishers Farm. Discipleship and repentance take time, and we want to be sure that any resident is ready and willing to make the time commitment and the financial commitment needed. Some scholarships are available based on financial need. In the special case that someone is maintaining a job while living at Fishers Farm there is a recommended monthly donation of 200.00 to cover room, board, meetings, and materials. All other Fishers Farm residents will be participating in 6 hour workdays on Monday-Friday during work hours. These workdays will include volunteer work for churches, widows, and others in need, as well as paid work projects (when available) to cover utility and food costs at Fishers Farm. Many facilities similar to Fishers Farm have a high monthly cost. We know that many cannot afford this, and do not have family who can afford this. We want to assist those who otherwise would not have the option to go to a move-in facility. We also believe that the burden of the cost of living should be primarily the responsibility of the resident and not just their family and loved ones. Residents must hand-write one Proverb every day for the first 31 days of their stay at the facility. Then, they will make their way through the workbook “Walk of Repentance” each morning. This process helps to instill the habit of daily devotional and quiet time every morning, prior to breakfast. This is a 24-week study guide and workbook by Steve Gallagher. Its theme addresses the challenges of Christian living, one step at a time. We use this for daily homework, with a weekly group review and discussion. This is a daily, Monday – Friday morning study; a simple, topical devotion to help residents power up their minds with Scriptures and to prepare for the day. This study is a workbook study. It establishes a familiarity with the Bible and its history, purpose, and power. FoF helps facilitate deeper understanding in our quest for sanctification. There is a daily homework guide and a weekly group review and discussion. This book is designed to give readers a better perspective of the power of sin and the flesh. Many people tend to use Satan as an excuse for their sin. At The Mission House, we believe that a depraved mind (directly resulting from the Fall) is one of the main reasons we fall into sin. (James 1:14-15). This book gives residents a better understanding of where our real battle lies. This study includes a weekly group review and discussion. This is a chapter and workbook combination. It has become one of the most important and best tools at The Mission House to help our residents gain a clear picture of the sovereignty and control of God. This book teaches on how and why we must rely on God and learn to trust Him in all things. This book, if used correctly, can help our residents to understand and appreciate the hugeness of God, and the smallness of themselves. It is designed for daily homework and weekly group discussion. This is a 13-week chapter and workbook designed to help residents to overcome the world and develop fruitful living habits. It includes daily homework and weekly group review and discussion. In the most comprehensive treatment of sexual addiction available, Gallagher shows men how to destroy the idol of lust and paves the way for a radical transformation of their heart and life.